Please supply your own contact details and the answers to a few simple questions, plus another contact name and number in case of medical emergency. To the right of the green heading on the form, is a grey slider. It changes colour when you hover the cursor over it. Click and hold to move down and up. After completing the form, it’s a good idea to check it before pressing the SUBMIT button, although there is the option of amending it after submission. The replies are all checked. We will contact you if any information appears to be unclear. If you are unable to complete the form, please ask the group leader for blank forms to be filled in by pen before work commences so that you are covered by insurance. This information will be stored electronically and can be viewed only by group leaders. Names, email addresses, physical addresses and telephone numbers are used only to contact the member concerned. Horsham Green Gym respects your privacy and will not disclose your personal details to a third party except in cases of emergency (e.g. medical). The information will be held until you tell us by email or in writing that you want it to be deleted. Horsham Green Gym's website is hosted by, but not compiled by TCV. The information contained on this website is for general information purposes only, supplied by Horsham Green Gym. The views provided by Horsham Green Gym are not representative of TCV. TCV is not liable for any loss or damage including, indirect or significant loss or damage, or any loss or damage whatsoever arising from loss of data or in connection with, the use of Horsham Green Gym's website. 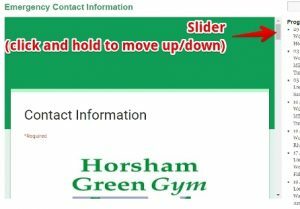 TCV does not endorse, control or approve the content on Horsham Green Gym's website.